The latest report of the UN, published this last week by the IPCC ( Intergovernmental Panel on Climate Change) , was a global alarm and big wake up call for all governments, organisations and civil society around the world. It is a known fact that global populations are rising exponentially making their consumption grow as well, supposing an ever growing energy demand as well as enormous rates of CO2 emissions. Most of these emissions are due to the fact that most of the governments still rely on fossil fuels for the powering of industries, households’ consumption, transportations etc… These emissions amount to 1010 Gigatons from the year 1855 to 1999, years of the industrial revolution era. In the relatively small time period from 2000 to 2015, we have released another 500 Gigatons. Our ‘’carbon budget’’ indicates how much we can still release before a catastrophe ; today, the budget is 335 additional Gt of CO2. We produce annually around 36 Gt of carbon emissions, that is to say, we have 8 years until we use our carbon budget in a disastrous way, if emissions continue to rise by 2,5% every year , as It is the case at the moment. The World Resources Institute also analyzed some of these aspects and added that in order to have a medium chance of limiting warming to 1.5°C, the world can emit 770 gigatonnes of carbon dioxide (GtCO2). To have a likely chance (67 percent), the remaining budget drops to 570 GtCO2. 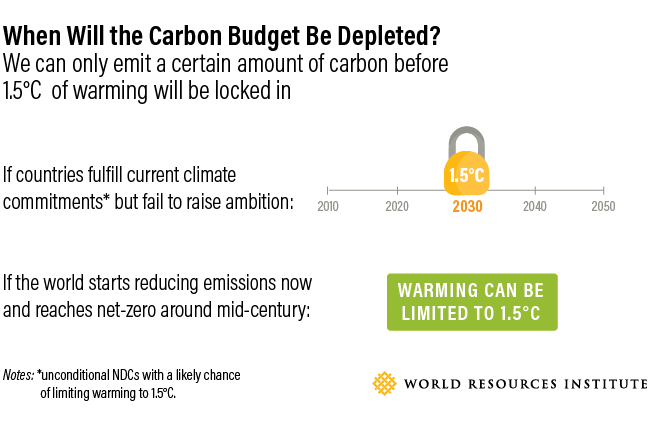 To have a likely chance of keeping warming to 1.5°C over the longer term, the world will need to reach net-zero emissions within 25 years. In the context of such an imminent climate emergency, Gaia Energy Holding has answered effectively to the UN’s report by elaborating a new strategy on the acceleration of its projects that count already a total of 4 Gigawatts on 22 Renewable Energy projects spread in 10 African Countries, in order to respond to the call for action at a global scale and expand the capacity of its pipeline. ‘’Gaia Energy Holding is ready to accelerate the speed of development of its RE projects in Africa that counting a total over 4 GigaWatts pipeline, and enlarging it into more countries if necessary”. Gaia’s CEO , Mr Alain Kerboriou, former VP of Vestas, added: “First, we shall do our best to establish political alignment with local decision makers in the countries , including presidency, ministry of energy and ministry of finance, as well as local utility providers . This measure intends to develop infrastructure and policy in the countries where we develop projects , as well as the acquisition of the adequate lands for their realization. To resume, we add that 1.5 °C is the goal , and maximum point that we should keep our global warming at, to avoid irreversible catastrophe. Going beyond this number will require carbon removal, a process that is way too complex, expensive and unsafe yet. On this ultimate worst case scenario solution, the report also mentions that there are a number of different ways to remove carbon, such as bioenergy with carbon capture and storage (BECCS), afforestation and direct air capture and storage (DACS). Deploying carbon at the scale that climate models assume is untested. Given the risks and uncertainties related to various carbon removal approaches, scaling would have to be pursued in a safe and prudent manner. 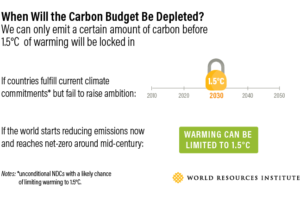 If the speed and scale of deployment is limited, this would leave a lot of questions on how much we can rely on this strategy to meet the 1.5 degree goal, especially for those pathways that overshoot 1.5˚C. Limiting global warming to 1.5ºC would require rapid, far reaching and unprecedented changes in all aspects of society, the IPCC , UN member, said in the assessment. With clear benefits to people and natural ecosystems, limiting global warming to 1.5ºC compared to 2ºC could go hand in hand with ensuring a more sustainable and equitable society, the Intergovernmental Panel on Climate Change (IPCC) said on Monday. “The Paris Agreement was monumental, but we must now go further, ratchet up commitments and develop solutions that meet the scale of the climate crisis. The report will encourage the development of new technologies, which is important. However, time is running out, so we must capitalise and build upon the solutions available today. Solving the climate crisis requires vision and leadership. Unfortunately, the Trump administration has become a rogue outlier in its shortsighted attempt to prop up the dirty fossil fuel industries of the past. The administration is in direct conflict with American businesses, states, cities, and citizens leading the transformation. Global Warming of 1.5ºC is the first in a series of Special Reports to be produced in the IPCC’s Sixth Assessment Cycle. Next year the IPCC will release the Special Report on the Ocean and Cryosphere in a Changing Climate, and Climate Change and Land, which looks at how climate change affects land use. The Summary for Policymakers (SPM) presents the key findings of the Special Report, based on the assessment of the available scientific, technical and socio-economic literature relevant to global warming of 1.5°C.